Laugh Out London- Tuesday 28th Feb! As recommended by Time Out, Spoonfed & London is Funny! Get your tickets here for just £4 (£3 concession) ! Introducing a brand new night from Laugh Out London, where we take over The Queen’s Head in Piccadilly Circus with some of the top pros on the circuit, and some brilltastic support. Here’s the fantastic line-up, all of which comes to you for the bargain price of £4 (£3 concession) if you book in advance, or £5 (£4 concession) if you show up at the door. Tickets available at http://www.wegottickets.com/event/154244 or email laughoutlondon@hotmail.co.uk to reserve a place at the discounted price. 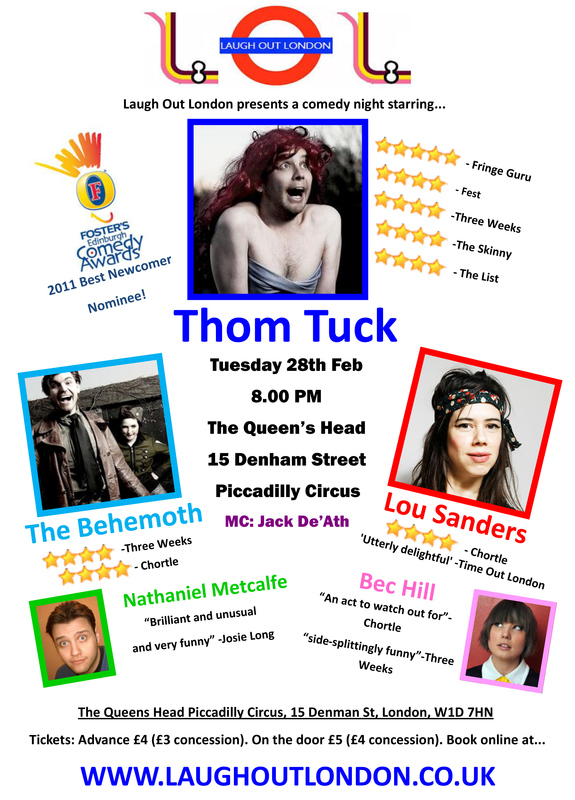 THOM TUCK – One third of Radio 4 favourites, The Penny Dreadfuls, and a Best Newcomer nominee in his own right at the Edinburgh Fringe 2011, Tuck displays a sweet madness that has tackled love, loss and Disney sequels. THE BEHEMOTH – A sketch group like no other, John-Luke Roberts (Radio 4, E4, BBC3) and Nadia Kamil (BBC 7, Channel 4, former trapeze artist) combine the absurd and the intellect in an increasingly ridiculous world. LOU SANDERS – A performer of offbeat charm and slight surreality. 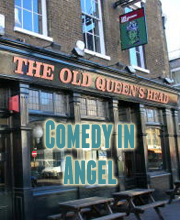 One of London is Funny’s People to Look Out for in 2012. BEC HILL – Australia’s comedy sweetheart. Flipcharts and funnies. Also one of Time Out’s funniest comedians on twitter. NATHANIEL METCALFE – A patented LOLFav relates odd observations on the most obscure niches of culture in the most enthusiastic fashion. Also, some stories about Danny Dyer’s artistic career.